It's nice to know I'm not the only one who uses a 'design floor' rather than a wall. At our place we have a 'design floor with dog accessory (not optional)'. Love those HSTs (see, I'm learning the lingo!). Pink, Orange = delicious! This looks fabulous. Love your floor, beautiful colours. I like. Will make a lovely mat. wink wink. It looks gorgeous but the thought of making all those triangled corners meet is making me a little faint. Can't wait to see it finished. GREAT colours! Gorgeous and bright. Oh it's so warm looking! Love it Andi, LOVE IT! Ahhh all my favourite colours combined... bliss! Oooh yes I'm a little fond of that colour mix myself. Very nice design floor too - bit like mine! Oh Andi, it's beautiful! 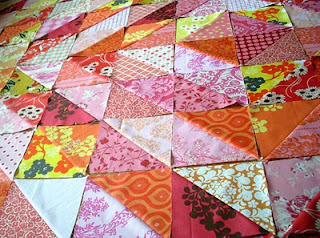 See you tomorrow with a somewhat more 'beginner-ish' quilt top! OH! Yummy colours, Andi. Love it! 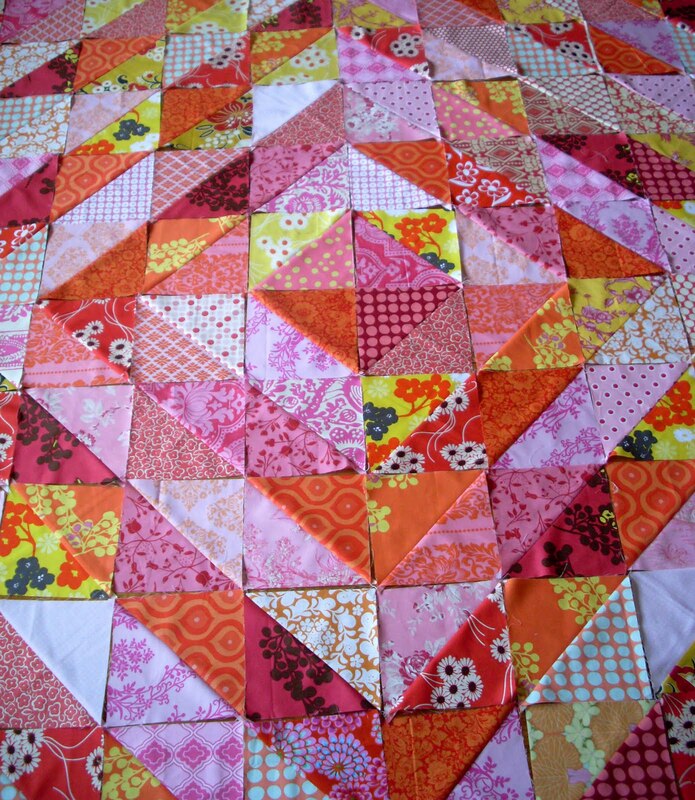 So many triangles ...I'm feeling dizzy. Bee-utiful!! Love those luscious colors! Ooh... Now that I've explored the scrappy Values quilt, I really do need to try the two colour versin like this. I love it!